Sept 20-26, 2009 / Bangor, Maine -- After a drive through one of the most beautiful parts of the country, we arrived in Bangor about 7:00 PM on Sunday. We left Burlington, Vermont at 10:30 AM, stopped in Montpelier to take some photos and then spent Saturday night in Gorham, New Hampshire at the Walmart Supercenter there. We were supposed to meet up with Joe's friend Sue for dinner but arrived too late and missed it. 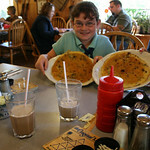 But we were able to make it up for breakfast at the Wagon Wheel, a great place. They have the BEST pancakes we've ever had with real maple syrup from the local area. The leaves are turning, but not quite to the brilliant stage yet. There will be one tree in a forest of green with it's leaves in shades of red, yellow or orange. My guess is that in one to two weeks things will be in full fall colors. We're at The Pumpkin Patch RV Resort where we stayed last year. It's a great park although Sprint coverage is weak so my Internet connection is lacking. They have great WiFi though so I can connect with my laptop and get my work done that way. I've been deluged with issues from my job. The email server went down which took all of my time Monday and is continuing to haunt us. Joe's been feeling under the weather and has been in bed ever since we arrived. We're hoping that things will improve without the need for a hospital this time. Our next stop is our favorite campground, Saddleback Campground in Northwood, New Hampshire. It's in southern New Hampshire just northeast of Manchester, southeast of Concord, the capitol. Love it. Been there twice and would return again. The Pumpkin Patch RV Resort provides a quiet and relaxing country atmosphere. We are within driving distance to many coastal areas including Rockland, Camden, Castine and Bar Harbor. Maine boasts of many more than 60 lighthouses, many of which can be accessed by car. Interesting places to visit nearby are the Lumberman's Museum, Ft. Knox, Leonard's Mills Forest & Logging Museum, Penobscot Marine Museum, Children's Museum, Coles Transportation and Stephen King's home. Sports enthusiasts can enjoy golfing, stock car racing, harness racing, miniature golf and bowling. For those shopaholics we are close to a major mall, flea markets, antique and collectible shops.